This last week was a big one here in the Netherlands because our beloved Queen Beatrix abdicated the throne after 33 years in favor of her son, the new King Willem-Alexander and his stunning Queen Maxima. The celebrations took place on the annual Queen’s Day, and for the whole country that meant a day off on Tuesday to roam the market stalls that citizens are allowed to set up for the day selling their unwanted knick-knacks. It’s a treasure trove, I tell you. The first year I was here for Queen’s Day, we picked up our solid wood coffee table for ten euros. This year, I scored some vintage lace which I think I’ll put to use for the wedding, as well as a trio of marble tealight candle holders in mint condition for 50 cents! Anyway, what with the day off and a few deadlines, the week just evaporated. 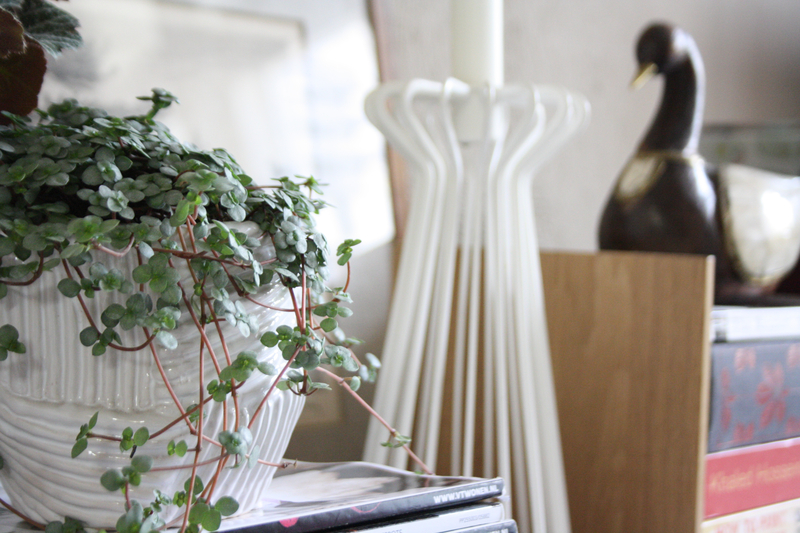 So, here I am on a Friday night with some pretty for you – some home styling incorporating plants. We are so lucky here in the Netherlands to be able to buy fresh flowers for next to nothing, and there’s nothing I love more that heading home from the markets with a huge bunch of blooms to scatter around the house. But. No matter what I do, they just die on me! I know, that’s quite normal, but I sometimes just want something fresh around the house that will last longer than a week. I was never really a fan of plants in the house because they remind me of how old people gather them up on window sills to collect dust, and usually those dust covered things are ferns, which I’m not a huge fan of. 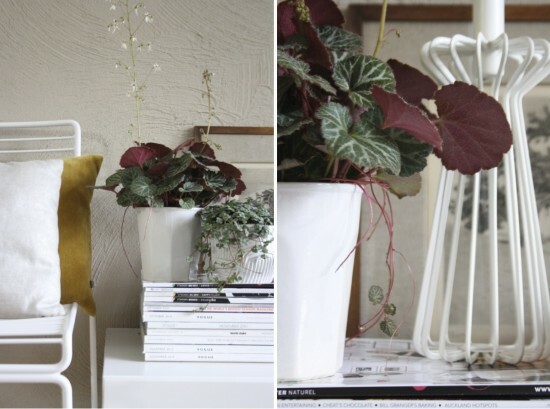 But in small doses a little bit of green in a well selected pot can bring a vignette to life, literally. So last weekend I skipped the market and headed for the garden shop, Lola bouncing along in her bike seat on the front, and came back home with a couple of pots and plants to go in them. Here are the results. I am really liking the simple white pots, particularly the little one with a bit of texture. I love how just a touch of greenery brings life to a neutral backdrop, and the combination of the green against the white and wooden accessories. 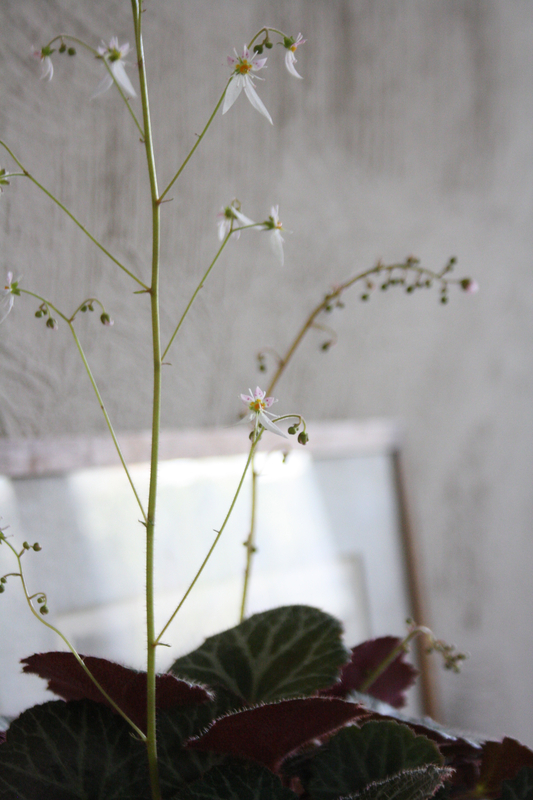 When selecting the plants, I went for the one with the tiny white flowers to add a little pretty to the scene and love how delicate it looks. 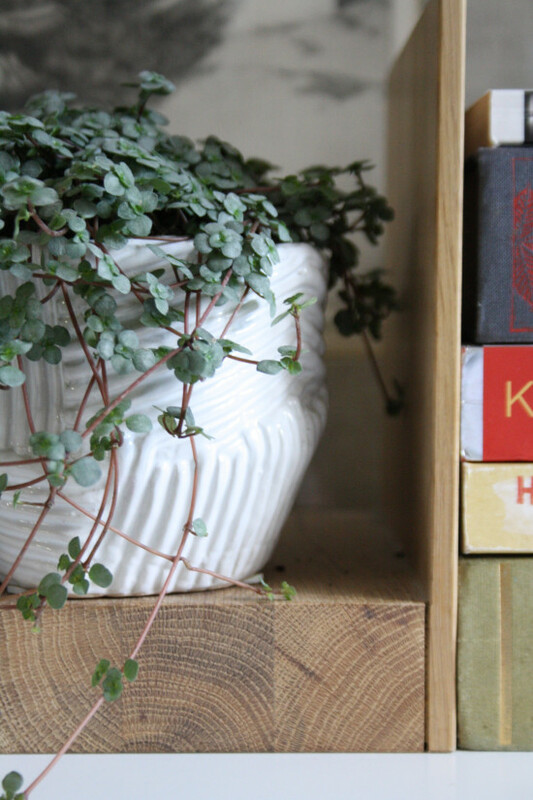 Also love the long strands of the smaller plant, particularly when draped over the spines of stacked magazines. Been enjoying this view all week! The lithograph is an original work I picked up from the antique markets last weekend, too. I love the serenity of the image with the huge oak tree and the linen mounting. It will be a lovely addition to a gallery wall one day, but for now it is a great backdrop to my green scene. 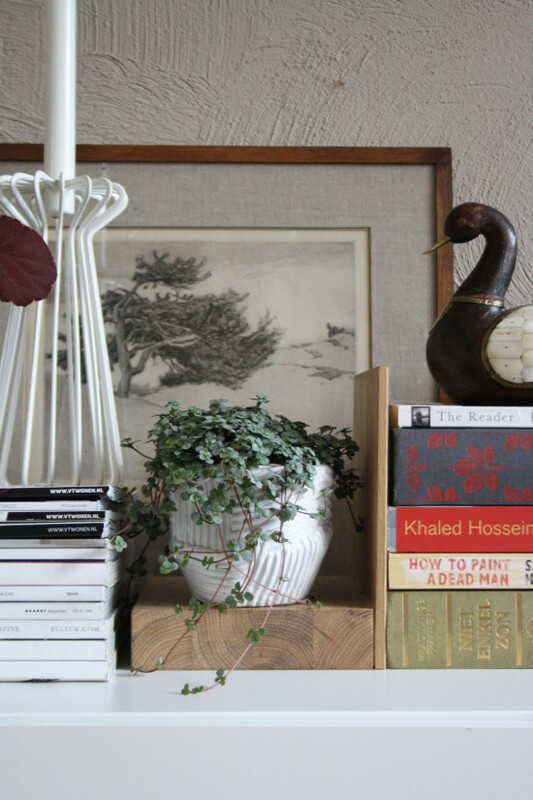 The oak bookends are by Pilat & Pilat and the candle holder was an Ikea purchase a while back. The only question that remains is how long I can keep these plants alive. 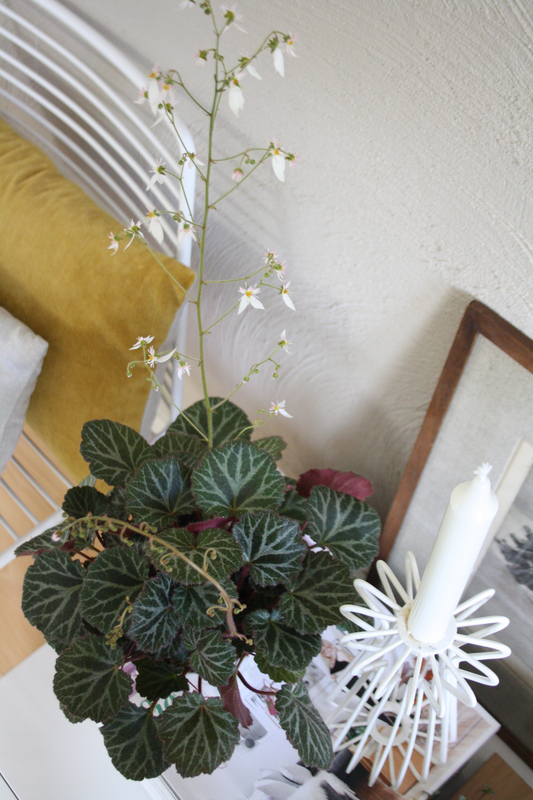 I am a self confessed plant killer, with a mortuary in my back garden. I even kill orchids, which I am told never die. So I’ll be interested to see how these go! Sending warmth and sunshine to you all, and wishing you a lovely weekend! Lovely styling! I’m totally the opposite. My fresh flowers last forever (current record: peonies for three and a half weeks) but I keep killing house plants. Love the abundance of flowers in NL but wish I could keep house plants too! @Deepa WOW! What’s your secret to keeping fresh flowers? That’s a pretty good record you’ve got there!